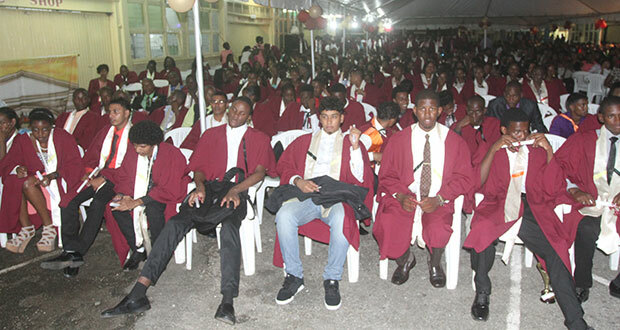 WITH the pride of 63 years of excellence behind them and a pass rate of 61 percent in one of the nation’s most prestigious technical institutes, more than 500 students last evening graduated from the Government Technical Institute (GTI). “Across the industrialised and developing world, economic growth is increasingly linked to skilled training necessary to raise labour productivity and average labour standards,” so said GDF Chief of Staff Brigadier, Mark Phillips, who delivered the feature address to the graduates. “Technological vocational education must be viewed as an essential prerequisite for socially balanced economic growth,” he stated. The GTI began operations in May 1951 to provide training in craft skills; but in July of 1956, technician level courses were introduced into the institute, which further developed into diploma level programmes. With a current student population of 1,785, Competency Based Education and Training (CBET) are now offered in masonry, plumbing, furniture making, and motor vehicle repairs, to name a few. With a pass rate of 61 percent, GTI Board Member, Major General (Rt’d. ), Norman Mc Lean, expressed dissatisfaction with the pass rate. He said, “The results were not stellar in my view,” as he urged students to push for a 66 percent pass rate, reflective of two-thirds of the entire graduating class. On another note, the Institute recorded exceptional performances at the level of the National Awards given to students throughout the Technical Institutes in the country, where GTI Georgetown managed to walk away with six of the seven awards. Commenting on the progress of the Institute and where it could be, GTI Principal, Carl Benn spoke of incremental steps as the Institute creates greater partnerships, both locally and internationally. “We are anticipating the delivery of higher level programmes in the not-too-distant future, where we will move from offering Level One and Two, and moving onto offering Level Three, that is equivalent to an Associate Degree,” Benn added, as he hopes the Institute will be re-branded to the standard of a Polytechnic Institute. By all appearances, the evening belonged to Valedictorian Mark Gomes, who not only passed with distinction as he read for a Technician Certificate in Electrical Engineering Pt. II, but also walked away with a National Award upon completion of the Guyana Technical Education Examination. Gomes attributed his successes to his mother for her guidance, and to his father and grandfather, from where he seemed to have drawn his inspiration, since, according to him, both of them are employed in technical fields. “The roots of education are bitter, but the fruits are sweet,” a humbled Gomes read in his address to an appreciative graduating class who warmly embraced his presence with loud applause and a standing ovation. Delivering the final charge to the graduates, Chief Education Officer, Olato Sam urged them to reshape the social fabric of this society as they ought to be keen on what they stand for, not to allow themselves to accept substandard payment and conditions. “Let this be only one step in your educational achievements, and structurally realise a way that will afford you the opportunity to engage in life-long learning,” the Chief Education Officer noted conclusively.